Let’s start with the notion of a “wolf moon.” This is simply, the supposed it name that some Native American tribes gave to a Full Moon in mid-winter. Think of all the, almost, iconic images of wolves walking through the snow by the light of the Moon. It’s really just a way of tracking the Moon; it doesn’t have some supernatural meaning. And while animals do have significance in many Native American tribes, the “wolf’ shouldn’t be seen as more significant than any other. Next, let’s take the idea of a “Super Moon.” In recent years this has become a soundbite, click bait. It seems to suggest, that somehow, it’s a rare occurrence perhaps even a once-in-a-lifetime opportunity. The truth of the matter is during a “super moon” the Moon and earth are simply closer in proximity than they are at other times. Consequently, the moon appears larger from our perspective on Earth. It is super big if you will. And while this can result in greater intensity with regards to low and high tide, it does not necessarily amp up the psycho-spiritual impact of a Full Moon. Now let’s turn to the idea of a “Blood Moon.” It’s really just a way of saying a Full Lunar eclipse. It is called a blood moon because the moon gets blood red when eclipsed in its totality. Eclipses are powerful, and we will soon explore that, but the language of a blood moon can create the connotation that there is something dark and sinister at play. In earlier times in human history eclipses did often bring up fear due to a lack of understanding of what was occurring. But really it just amped up whatever emotion was in play. Because early humans did not understand what causes an eclipse their fear of the unknown became magnified. Tonight, beginning around 10:10 PM EST we have a Lunar eclipse. It reaches totality and 11:41 PM EST. 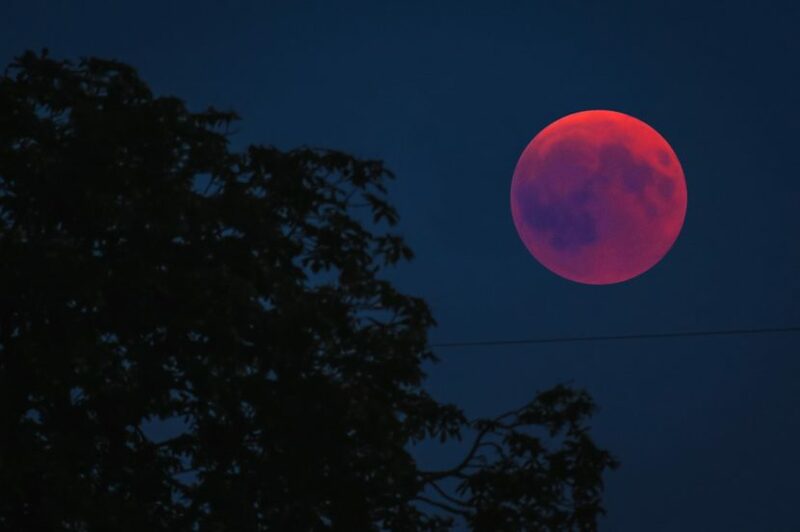 The Moon will be eclipsed entirely and thus blood red for about an hour, and not fully visible again until 2:15 AM Monday morning (on the East Coast). Additionally, this eclipse will be visible throughout the whole of the United States. A total Lunar Eclipse is much more common than the total Solar Eclipse that occurred a year and a half ago, who shadow covered the length of the continental US. Like the 2017 August Solar Eclipse, this Lunar eclipse is also in the sign of Leo. As a result, there may be some hints of events that were occurring then that reappear coming days. To understand this particular eclipse, they’re three things in particular to unpack. To begin with, like all Lunar eclipses it is a Full Moon. Full Moons are about things coming to fruition, energy and efforts have reached their zenith. Activities and projects that have been building and culminating for months or even years come to a close or reach a point of completion. And in their conclusion, we are asked to begin to set the steppingstones and making space for a new phase or stage of a given project or adventure. Things must reach a place of completion or ending so that we have the room to welcome the new. This holds true for all Full Moons. And because the Moon is often associated with one’s emotions feelings of all kinds, joy anger, jealousy, love, compassion, etc. become heightened. Because this Full Moon is also a Lunar eclipse, it possesses a duality in its energy. For it is both representative of a Full Moon and the completion associated with that, as well as a New Moon a time associated with invocation and beginnings. As a result, things in our life are both coming to a conclusion and being birthed. The duality of this energy often coincides with a thinning of the veil between the spiritual world and the terrestrial. As a result, it is particularly a powerful time to set an intention. Whether that is an intention of releasing or creating. Because this particular Lunar eclipse falls at 0˚ Leo, the sign of creativity, play, and our inner child. When looking to create a way of setting an intention doing so in a creative way will be the most advantageous. Rather than merely making a laundry list of what it is you would like to invoke or complete come up with a more creative form of expression. This could be a painting, drawing interpretive dance or a poem. Maybe there is a song you have wanted to write, but the melody has been alluding you. Perhaps it will come to you tonight. The point is to find a fun and creative way to either invoke or release. The more joy you bring to the process the more powerful this transition is likely to take shape. Hoping you have clear skies tonight so you can see Luna in all her glory.